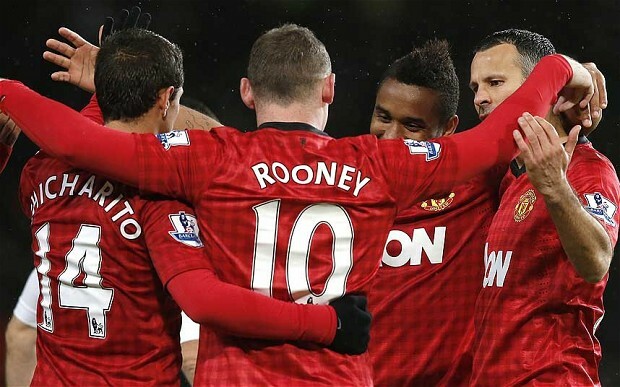 Home Premier League How Can Manchester United Win the Treble in the 2013/14 Season? How Can Manchester United Win the Treble in the 2013/14 Season? An ‘average’ side according to some, but to others, it was Fergie’s 2012/13 treble winning side. The beginning of last week and Manchester United fans’ dreams were full of a possible treble glory after many a pundit had commented on what could’ve been a glorious year for the Reds. Tuesday night came around, built up to be the match made in heaven, the legendary match, but it was not to be. Ronaldo returning, Ferguson versus Mourinho; it was all there, all the beauty, the romance of the game. However, the romance was not played out by a certain referee, sending Nani off after 56 minutes and as a result turning a genius tactical plan from Ferguson into an easy opportunity for ‘the Special One’ to come and take the win and progress into the Quarter-Finals. All is looking plush for the Reds, a two goal advantage; they have the momentum, every player full of happiness and confidence. Nothing could go wrong. And then it did. A shambles of a second half; usually the period in the game where United excel and players are falling over their feet watching Hazard strut his stuff. To cut a long story short, Chelsea score two and earn themselves a replay. This is something United definitely don’t need as they look to secure the Premier League without any embarrassing results. So, United’s treble dream cut short and their double chances hanging by a thread. The only good thing about that week for the Reds? They’re still 12 points clear at the top of the Barclays Premier league table. A brilliant feat. Now, I’m not saying we’re never allowed to give David De Gea a rest, but come on, what good is putting Lindegaard of Amos on instead of him in an important game like in the FA Cup? Play him and only him, and when the lad asks for a rest give him it in the smaller games. We have one of the best selection headaches in the world at United. We have the solid highly defensive partnership of Rio Ferdinand and Nemanja Vidic, the always available Jonny Evans can go with anyone at any time, Phil Jones is undoubtedly one of the best CDM’s in the league who must not be sold, and then there’s good old Chris Smalling who has been plagued with injury but is England’s number 2 center back. This season, we have not had the gracious chance to see Jones and Smalling keep the goals out, but Fergie knows they are there and I’m sure that if he brings them into the rotation system of Ferdinand, Vidic, and Evans, United will have the best defense in the league. This is not one I can give advice on. He used to be brilliant and one day he changed, and this season he has been dreadful, nothing like ‘Antonio Valenica, Number 25, dreaded by every fan in the league.’ Ferguson is a master and it will be one of his greatest challenges, and if he completes it, the Manchester club have a good chance of treble glory next season. This is one of the most important points of my plan. Keeping every single player is key to winning the treble, considering this side will have been together for a whole year, probably winning the Premier League and becoming a tight unit. The players from the year before will be even closer because of the tragic loss of the Premier League on the final day, and together, they will be unstoppable. All this along with the fact that every single player is brilliant enough to be in a Manchester United shirt. Should someone come in, it could be an amazing impact buy like a certain Robin Van Persie, or it could be a horrible flop and disrupt the team from a treble like Diego Forlan. In my view, we don’t need to buy anyone apart from my next point. The key word here is backup. What I am trying to say is not ‘Carrick and Cleverley aren’t good enough blah blah blah.’ I’m saying, ‘Carrick and Cleverley are brilliant, but they need some rest.’ You saw a perfect example of it on Sunday against Chelsea; Carrick and Cleverley had a great first half, making nice play, and then in the second, all their work went down the drain. They got tired, made some sloppy errors and conceding 2 goals. So, my thinking was buy another good midfielder for not too much cash so that (especially Cleverley as he is young) Cleverley and Carrick don’t get fatigue after too many games in a row, especially at the end of the season or in winter when the games start to build up. The only other player we should buy if they’re available is of course none other than Portuguese International Cristiano Ronaldo. A list, you may ask? By ‘list,’ I mean who we will sign when the season has drawn to a close. This season, we do not need to do that as we have no one player we specifically need to buy. Next season, we definitely will need to purchase new players. We will need a new left-back, as Patrice Evra will be slower, older, and all in all less good. We will need a new midfielder, as Scholes and Giggs will have left, and Carrick will be growing older by the second while slowing and losing his ability. We will also need a striker to give Rooney and Van Persie some rest while giving Javier Hernandez and Danny Welbeck their deserved weekly run out. I think you get the point, we’ll need players and what I’m saying is we need to plan for these players to get the best out of the side in the future. Yes, I am talking about the way to play. But not just the way of playing, attacking, nice football. Oh no, I’m talking about the way of coming back in every game no matter what he circumstances are. They fight till the very end and that is what has helped them this year in their bid for the Premier League. Next articlePremier League vs La Liga: Which League is the Best in the World?